The leader of the Indigenous People of Biafra (IPOB), Nnamdi Kanu, is absent in court as hearings on his trial begins. Kanu who was expected to appear before Justice Binta Nyako of the Federal High Court is no where in sight. Raising the issue, the director of public prosecution, S. M Labaran said the state fears that the trial might not go on as planned. Former ministers of aviation, Femi Fani-Kayode and Osita Chidoka arriving court. Labaran said the first defendant who was granted bail on August 25, on the grounds medical challenge is not present in court. In the wisdom of this honourable court, the court gave some conditions and one of the conditions is that the first defendant must not be seen in midst of more than 10 people," Labaran said. He said failure to attend proceedings in court is a violation of the orders made by the court. "We urged this honourable court to revoke the bail granted the first defendant and issue a bench warrant for the arrest of the first defendant and finally my Lord, order the sureties, namely Senator Enyinnaya, Immanuel Shalum Okabenmadu and Kochukwu Uchenna to show cause why the bail bond of N100 million each shall not be forfeited," Labaran added. He also called for the commitment of the three sureties to prison. But in his objection, Kanu's lawyer said he should have been called upon to explain the whereabouts of the first defendant. "I don't know where my client is whether he is dead or alive after the raid," Ejiofor said. However, the three other defendants - Benjamin Madubugwu, Chidiebere Onwudiwe and David Nwawuisi were brought into the court by prison officials. 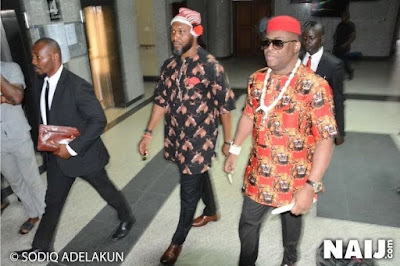 The former ministers of aviation, Femi Fani-Kayode and Osita Chidoka, are currently in court to support the co-defendants. The duo are dressed in Igbo traditional attire popularly known as 'Isi agu' and caps. The former ministers who have also been on the support team of the missing IPOB leader, NAIJ.com gathered were in court to show solidarity for Kanu. The ministers among other notable Nigerians joined many crowds who thronged the court premises for the trial. Also, security operatives in the hundreds are stationed around the court premises ensuring that individuals who had no business in the court do not gain access into the court. Kanu's trial is expected to commence today, October 17, before Justice Binta Nyako of the Federal High Court in Abuja. However, since the second military invasion at the residence of the IPOB leader in Afara Ukwu Umuahia, Kanu has not been seen or made any public appearance. His disappearance has also raised lots of suspicions concerning his whereabouts. Also, his lawyer, Ifeanyi Ejiofor, in a recent move filed a suit against the chief of army staff, Tukur Buratai. Ejiofor in his suit alleged that the military might have either killed his client or taken him away during a shootout at his residence in Umuahia, Abia state capital. The lawyer in his suit prayed the court to make an order mandating the Nigerian army chief to produce his client for his appearance in court for trial which had been instituted by the Department of State Services (DSS).